(Photo: Ecumenical News / Young Kun Park)The Archbishop of Canterbury Justin Welby holds a press conference during the 10th Assembly of the World Council of churches in Busan, South Korea on November 1, 2013. The Archbishop of Canterbury has suggested a linkage between the UK's vote to leave the European Union, known as Brexit, and the election of Donald Trump as U.S President to fascism. 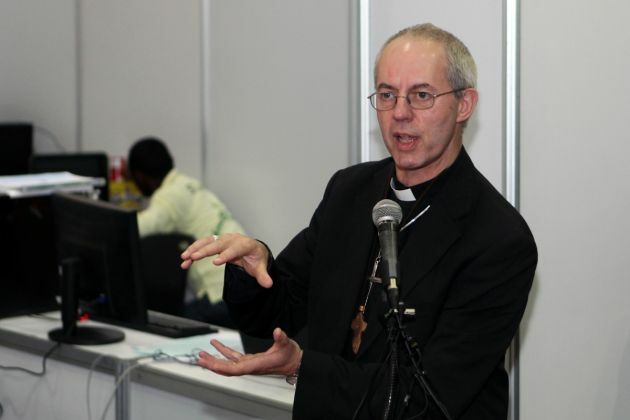 Justin Welby, the spiritual leader of the Church of England and of the 80 million strong Anglican Communion, was speaking Feb. 14 at the church's general synod, The Independent reported. "There are a thousand ways to explain the Brexit vote, or the election of President Trump, or the strength in the polls in Holland of Geert Wilders or in France of Madame Le Pen and many other leaders in a nationalist, populist, or even fascist tradition of politics," said Welby. "Almost certainly there is no simple explanation, almost certainly the impact of globalization economically, or marginalization politically and of post-modernity culturally have some role to some extent." Although the Anglican leader had previously suggested Trump's politics and policies were based on fear and exclusion, his criticism went a step further by linking the U.S. president in with far-right party leaders in Europe, The Guardian reported. Regarding Brexit, Welby's connection between the referendum result and far-right and neo-fascist politics is likely to infuriate those who say the vote was the outcome of social, political and economic marginalization and exclusion rather than stemming from deep-seated nationalism, the newspaper commented. The archbishop went on to cite, "the impact of globalization economically, or marginalization politically and of post-modernity culturally" as playing a role in the new political landscape, while also noting there is no simple explanation. He said, "That will be the material of a thousand PhDs and no consensus in the next 50 years. We are in the middle of it all and we see neither the destination nor the road we must travel." Still said Welby now is "a moment to reimagine Britain, a moment of potential opportunity, certainly combined with immensely hard work and heavy lifting." The Anglican leader said, "It is a moment of challenge, but challenge that as a nation can be overcome with the right practices, values, culture and spirit. This could be a time of liberation, of seizing and defining the future, or it could be one in which the present problems seize our national future and define us." The church has a significant role to play Welby asserted, despite its declining numbers, which he acknowledged by Welby, in bringing a fractured country together through its education of 1 million children in Church of England schools, its presence in every community and its role in national history.